like irritable bowel syndrome, heartburn, acid reflux, constipation, diarrhea, ulcers, excess gas, and more! Digestion problems are one of the top issues that send people to their doctors. Not to mention that Americans spend $2 billion a year on over-the-counter heartburn medications alone! Most digestive issues are caused by “functional” disorders — meaning they can’t be linked to a physical problem such as cancer or ulcers. Even if your doctor can’t pinpoint the cause of your symptoms, chances are you can still get relief thanks to The Sensitive Gut, a Special Health Report from Harvard Medical School. If you have heartburn, you may already know that drinks containing caffeine, such as coffee, tea, and colas, can trigger burning pain. Some people feel miserable after eating onions or garlic, while tomatoes and citrus fruits bother others. And who hasn’t regretted indulging in fatty or fried foods? They are notorious for bringing on symptoms. But did you know after-dinner mints, treats associated with helping digestion, could cause heartburn? 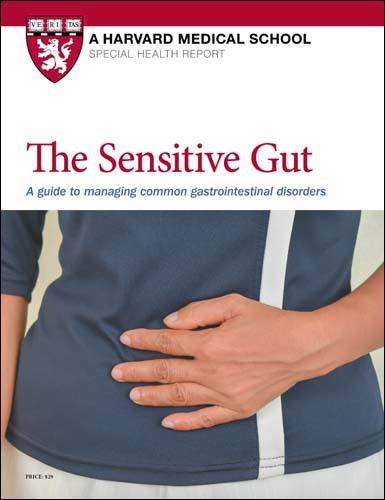 For more ways to relieve — or avoid — heartburn and other digestive disorders, send for your copy of The Sensitive Gut NOW!